Maurice was born circa 1817 at Kirchhausen, Heilbronn, Württemberg, Germany.2 He was the son of Franz Joseph Halter and Maria Anna Phoh. He married Carolina Witmajer, daughter of Christoph Witmajer and Erhardina Wunsch, on 11 July 1847 at Holy Cross Church, Warsaw, Masovia, Poland.3 He married Katherine Wunsch, daughter of Mathias Wunsch and Maria Katharina Förderer, on 15 November 1863 at Holy Cross Church, Warsaw, Masovia, Poland.4 Maurice died circa 1880 at Warsaw, Masovia, Poland. Maurice Halter was born about 1817 in the Village of Kirchhausen near Heilbronn in the then Kingdom of Wurttemberg, now the state of Baden-Wurttemberg, Germany. It did happen in Warsaw in the Parish of the Holy Cross, eleventh day of July, year one thousand eight hundred and forty-seven, at six in the evening. We make it known that in the consciousness of witnesses Wendelin Halter laborer twenty- seven years old and Frederick Baller laborer fifty years old, both residing in Warsaw, today has been concluded religious marriage between Maurycy Halter, young man, shoemaker, residing in Warsaw, under the number nine hundred and ninety-three Krochmalna Street, born in the village Kirchhausen in the Kingdom Wurttemberg, son of the late Jozef and Maryanna born Fau, spouses Halter, thirty years old, and Karolina Witmajer, young woman, residing in Warsaw under the number one thousand five hundred eighteen Marszalkowska street, in the service of maid, born in Hilpertrau in the Duchy of Baden, daughter of Krzysztof and Erhatyna born Woncz, spouses Witmajer, twenty-one years old. This marriage was preceded by three announcements, here in Warsaw, in the parishes of Holy Cross (Swietego Krzyza) and St. Andrew (Swietego Andrzeja), on the twenty-seventh of June, fourth and eleventh of July of the current year. No opposition to the marriage had happen. New spouses declared they have not concluded a prenuptial agreement between themselves. This act was read to the newlywed and witnesses, by us, newlywed (groom) and witness signed. The newlywed (bride) and the second witness do not write. This record provides much information about Maurice. In addition to his birth in Kirchhausen it lists his parents as (deceased) Jozef and Maryanna, born Fau, He also could sign his name and shows that his occupation was shoemaker. This record suggests that by 1847 Maurice was living at 1993 Krochmalna Street in Warsaw. It did happen in the parish of the Holy Cross - Swietego Krzyza- on the fifteenth day of November, year one thousand eight hundred and sixty-three, at five o'clock in the afternoon. We make it known, that in the consciousness of witnesses August Szefner, thirty- seven years old, and Franciszek Kaczorowski ,forty- eight years old, residing in Warsaw, both masters shoemaker, today has been concluded religious marriage between Maurycy Halter, widow of Karolina born Witmajer, deceased on the first day of August of the current year in the local parish, master shoemaker , residing in Warsaw, under the number one thousand three hundred and four, Nowy Swiat street, born in the city of Wittenberg, son of the late Jozef and Maryanna born Pfau, spouses Halter, forty- six years old, and Katarzyna Wunsch, young woman staying with her father, residing in Warsaw, under the number one thousand three hundred and four , Nowy Swiat street, born in the village of Marki, province of Warsaw, daughter of Mateusz and the late Katarzyna born Kweter, spouses Wunsch, nineteen years old. This marriage was preceded by three announcements, here in Warsaw in the parish of the Holy Cross, on thirty of August, sixth and thirteenth of September of the current year. New spouses declared they did not sign a prenuptial agreement between themselves. This act was read to the newlywed and witnesses and to the father of the newlywed (bride) giving permission to this marriage, then it was signed by the newlywed (groom), one witness, the father and us. The newlywed (bride) and the second witness do not write. This marriage record suggests that Maurice was a Master Shoemaker and living in Warsaw at 1304 Nowy Swiat Street when he married Katarzyna Wunsch in 1863. The next record we found is the baptism record of Maurice’s son, Wincenty in 1866 at Kokitno Church where Maurice is listed as a shoemaker living in Wolica, a rural area about 5 kilometers south of downtown Warsaw. The next record is the baptism record of Mauice’s daughter, Emily Halter in 1871 at Kokitno Church where Maurice is listed as a laborer and claims Emily was born in Jozefow, a rural area about 15 kilometer southeast of downtown Warsaw. These records suggest that by 1866 Maurice has moved to a rural area south of Warsaw and may have been employed in farming. [S19] Julius Andrew Sobon, "Record of Sobon Family Traits." [S942] Roman Catholic Chruch, Holy Cross Parish (Warsaw) Records, Marriage act 451, 1863 image 1191. [S710] Personal communication from Victoria Halter Smolinski, 29 Apr 1982. [S942] Roman Catholic Chruch, Holy Cross Parish (Warsaw) Records, 1847, Act 116, Marriage of Maurycy Halter to Karolina Witmajer, 11 July 1847. [S943] Roman Catholic Chruch, St. Alexander's Parish (Warsaw) Records, Year 1882 Marriage Act 74, Marriage Record of Jan Szczzurowski to Apolonia Krystyna Halter. (Index notation. Actual record not viewable). [S9] Cleveland Vital Records, Cert. of Death for Apolonia Suroski, Reg. No 627. [S710] Communication from Riverside Cem. 10 Aug 1991. Sec. 3, Lot 181, Gr. 3. Emily Halter was born in Jozefow which is located about 15 kilometer southeast of downtown Warsaw. Area is now part of Metropoloitan Warsaw. 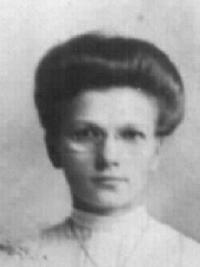 Emily was educated in a private school and convent in Warsaw. She immigrated to the United States from Poland about 1891, accompanying her sister in law, Antonia Szymankiewicz Halter, and her two children Victoria, and John. Antonia was joining her husband, Wincenty, and needed help with the children. Emily died at age 89 in 1980 and is buried next to her husband in Lakeview Cemetery in Cleveland. [S945] Roman Catholic Church, Records of Parish of Rokitno Poland, 1871, Act 110 Baptism of Emily Halter, born 12 Sep 1871. [S9] Cleveland Vital Records, Cert. of Death for Emily Sobon, Reg. No. 9857. [S710] Funeral attended by writer. 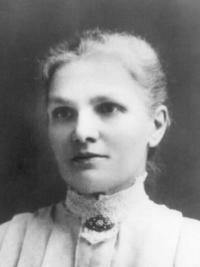 Anna was born in 1855 at Holy Cross Church, Warsaw, Masovia, Poland.2 She was the daughter of Maurice Halter and Carolina Witmajer. 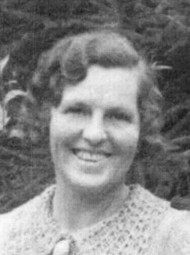 [S18] Emily Halter Majewski, "Halter Family Genealogical Records", Died in infancy. [S942] Roman Catholic Chruch, Holy Cross Parish (Warsaw) Records, 1855, Act 879,Birth of Anna Halter. Jan was born circa 1860 at Poland.1 He married Apolonia Krystyna Halter, daughter of Maurice Halter and Katherine Wunsch, circa 1882 at Saint Alexander's Church, Warsaw, Masovia, Poland.2 Jan died before 1928 at Cleveland, Cuyahoga, Ohio, United States. [S18] Emily Halter Majewski, "Halter Family Genealogical Records." [S163] Necrology File - Cleveland Public Library, Obituary of John T. Suroski, 18 Oct 1927, Reel 79. [S710] Personal comm. from Riverside Cem. 10 Aug 1991. Sec. 3, Lot 181, Gr. 2. [S163] Necrology File - Cleveland Public Library, Obituary of Marie F. Suroski, 8 Nov 1950, Reel 79. [S710] Personal comm. from Riverside Cem. 10 Aug 1991 Sec. 3, Lot 181, Gr. 4. [S163] Necrology File - Cleveland Public Library, Obituary of Henry H. Suroski, 2 Feb 1934, Reel 79. [S710] Personal comm. from Riverside Cem. 10 Aug 1991. Sec. 3, Lot 208. [S10] Cuyahoga County Ohio Marriage Records, Marr. Cert. of Arthur Suroski & Dolores Drier, Vol. 171, p. 328. [S163] Necrology File - Cleveland Public Library, Obituary of Peter Suroski, 15 Sep 1954, Reel 160. [S710] Personal comm. from Riverside Cem. 10 Aug 1991. Sec. 3, Lot 208, Gr. 2. [S10] Cuyahoga County Ohio Marriage Records, Marr. Cert. for B.F. Blaser and E.E. Szczurowski, Vol. 85, p. 498. [S163] Necrology File - Cleveland Public Library, Obituary of Emily E. Blaser, 13 Jun 1958, Reel 94. [S710] Personal comm. from Riverside Cem. 10 Aug 1991. Sec. 3, Lot 181, Gr. 5. Jan Szymankiewicz was born in 1819 in the small village of Cisowka, Stanislawow Community about 25 miles east of Warsaw Poland. He was christened in the Roman Catholic Church of St. Catherine of Alexandria in Pustelnik, Poland. (The records of Pustelnik Parish are in the Polish Archives in Warsaw. These records have been microfilmed but have not yet been digitized or made available on the web.) Some of the record books have been indexed and that index is the basis for the birth of Jan Szymankiewicz. The next record we find is Jan’s marriage to Malgorzata Kurant in St. Alexander’s Catholic Church in Warsaw in 1846. In that record Jan is formerly of the ;parish of the Holy Cross in Warsaw, age 27, his occupation is servant, and he is residing at 1722 Wieyska Street. He was born in the village of Cisowaka in the province of Warsaw. His parents are the late Andrzej, laborer, and still alive Maryanna, nee Gryz, Szymankiewicz residing in the village of Krzyczki province of Warsaw. Malgorzata (Margaret in Polish) is age 28 years old, her occupation is servant, residing at 1673 Mokotowska Street in Warsaw and was born in the village of Jesienna in the province of Radom. Her parents are the late Andrzej and Maryanna, nee Pawelczyk, Kurant, farm owners. There are likely children of this marriage but they were not found during a search of available on-line indexes. By 1870, Malgorzata is deceased and 57 year old Jan, a servant, marries Victoria, nee Frenkel, Soban, age 33, widow of Andrew Sobon on 30 October 1870 in St. Alexander’s Church in Warsaw. Compiled in Warsaw at the parish church of St. Alexander on 18/30 of October, 1870, at 7:00 pm. We declare that in the presence of witnesses Andrzej Dziewulski, 53, and Wincenty Lytowski, 58, servants residing in Warsaw, that concluded today was the religious marital union between JOAN SZYMANKIEWICZ, widower after the death of his legal wife Margaretha nee Kurant, he is a servant born in the village of Cziszow, Stanislawow uezd, son of the deceased, legally married, Andrzej and Marianna nee Griz, he is 57 years of age, and WIKTORIA nee Frenkel, widow from the death three years ago of Andrzej Soban, she is a servant born in the city of Turka, Kalisz province, daughter of the legally married Jacob and Rozalia maiden name unknown, Frenkel, she is 33 years of age. Both of them reside in the local parish, in house number 1756 Buk. B. [?]. The marriage was preceded by the thrice-proclaimed Banns of Marriage, published in the local parish church on 16/23/30 of October of this year. The newlyweds declared that no prenuptial agreement had been concluded between them. The marriage ceremony was concluded by Fr. 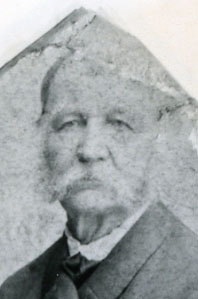 Ksawierius Rogowski, local administrator, registrar of civil acts. This act read aloud to the illiterate newlyweds and witnesses, and signed only by me. Administrator of parish, Fr. Ksawierius Rogowski. We have no record of his death but assume he died in the vincinity of Warsaw. [S943] Roman Catholic Chruch, St. Alexander's Parish (Warsaw) Records, Year 1888, Marriage Act 161, Marriage Record of Wincenty Halter to Antonia Maryanna Szyankiewicz , 24 June 1888. [S943] Roman Catholic Chruch, St. Alexander's Parish (Warsaw) Records, Year 1870 Marriage Act 109, Marriage Record of Joan Szyankiewicz to Wiktoria Frenkel, 30 Oct 1870. [S944] Roman Catholic Chruch, Pustelnik Church Parish Records, From Index of 1819, Act 25, Birth of Jan Szymankowicz. [S943] Roman Catholic Chruch, St. Alexander's Parish (Warsaw) Records, Year 1846 Marriage Act 76 ,Janem Szyankowicz to Malgorzata Kurant, 25 Oct 1846. Victoria was born circa 1847 at Turek, Tureck County, Greater Poland Voivodeship, Poland.1 She was the daughter of Jakob Frenkel and Rozalia (--?--). She married Andrew Sobon, circa 1866 at Poland.2 She married Jan Szymankiewicz, son of Andrew Szymankiewicz and Marianna Gryz, on 30 October 1870 at Saint Alexander's Church, Warsaw, Masovia, Poland.2,1 Victoria died at Warsaw, Masovia, Poland. The parents of Victoria are Jakob Frenkel and Rozalie (maiden name unknown). She was a cook and housekeeper for a wealthy family in Warsaw, Poland. She lived to over 60 years of age. She is said to have been quick tempered. [S17] 1910 Census Cuyahoga OH, E.D. 257, Fam. 366, 6525 Gertrude Ave., 30 Apr 1910. [S9] Cleveland Vital Records, Cert. of Death for Mary Racynski, File No. 7263. [S710] Section 24, Lot 143, grave 1. Buried in same grave above her sister, Antonia Szymankiewicz Halter. [S163] Necrology File - Cleveland Public Library, Cemetery Record for Ignatius Raczynski, Reel 66. [S710] Sect.46, Range 1, Grave 1. (Dau.) Szymankiewicz was the daughter of Jan Szymankiewicz and Victoria Frenkel. The parents of Andrew are not known, nor is his birth date. He was a coachman by occupation and died at about age 30. [S9] Cleveland Vital Records, Cert. of Death for Andrew Sobon, Reg. No 13084. He was naturalized as a citizen of the United States on 28 September 1896 at Cleveland, Cuyahoga, Ohio, United States.4 Andrew's occupation: Merchant. Andrew was born in Warsaw, Poland in 1867. He attended grammar school there where his favorite studies were geography and languages. In 1891, at age 23, he immigrated to the United States arriving in New York on 15 May 1891 and moving to Cleveland, Ohio shortly thereafter. He was accompanied on his trip by his half-sister Antonia Szmankiewicz Halter her two children and sister in law, Emily Halter. Emily was to become Andrew's wife a year later on 20 April 1892. On 12 Jun 1894, Andrew filed a declaration to become a United States Citizen with the Court of Common Pleas of Cuyahoga County, Ohio. On 28 Sept 1896, he petitioned the court to become a citizen and was granted citizenship. He worked as a florist, wire mill laborer and foreman. His favorite pursuits were reading, flowers, and music. He was very handy with tools. He was sociable and good natured. Andrew died at age 51 on 14 Dec 1918 from cancer of the throat. He is buried in Lakeview Cemetery in Cleveland next to his wife, Emily. [S710] Section 21, Lot 310. [S15] Cuyahoga County Naturalization Records, Petition for Citizenship of Andrew Sobon, No. 9359, 28 Sep 1896. [S213] Mark Alan Glover, "Glover - Wolf - Sobon Family Records." Stanley was born on 1 January 1898 at Cleveland, Cuyahoga, Ohio, United States. He was the son of Andrew Sobon and Emily Halter. 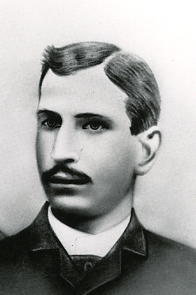 Stanley died in August 1898 at Cleveland, Cuyahoga, Ohio, United States. Mathias was born before 19 February 1797 at Hilpertsau, Rastatt, Baden, Germany.1 He was the son of Martin Wunsch and Margaretha Kuehmer. Mathias Wunsch married Carolina Krieg, daughter of Sebastian Krieg and Christina Mailer, on 13 January 1821 at Hilpertsau, Rastatt, Baden, Germany.2 Mathias Wunsch married Maria Katharina Förderer, daughter of Franz Michael Förderer and Maria Eva Schuhmacher, on 31 May 1831 at Saint Nicholas Church, Rettigheim, Wiesloch, Baden, Germany.3,4 Mathias died circa 1873 at Poland. Mathias (Mathew) Wunsch was born in Hilpertsau, Baden, Germany. Hilpertsau is a small village in the Black Forest area of Germany and is located on the Murg River about 1 mile south of Gernsbach. Today Hilpertsau is part of the Town of Gernsbach. The records suggest that Mathias grew to age and married Caroline Krieg in Hilpertsau in 1821. They had five children listed below. The last two children born in 1827 and in 1828 died shortly after birth and are not named. Carolina died 4 days after the birth of her last child in 1828. After the death of Caroline in 1828, Mathias removed with his family from Hilpertsau to Rettigheim, where he married Katharine Förderer in 1831. Rettigheim is a small town about 40 miles north of Hilpertsau and is the ancestral home of the Förderer family. In 1834, German emigration records indicate he moved his family to Marki, Poland. This is based on his daughter, Katherine, being born in Marki in 1845, Marki was a farm area directly across the Vistula River and 5 miles northeast of Warsaw. Family records suggest that Mathias ”owned a very large vineyard” which likely was in Marki. Mathias was able to read and write as he signed his name on many of the church records in Warsaw. By the time of the death of his daughter, Mary Anna in 1852 Mathias was living in Warsaw. [S963] Baden, Germany Roman Catholic Church of Hilpertsau, Hilpertsau Church Records 1795-1867, p. 10, 1797, Entry 3, Baptism of Mathias Wunsch. [S963] Baden, Germany Roman Catholic Church of Hilpertsau, Hilpertsau Church Records 1795-1867, 1821, Marriages, S1, p. 40. [S959] Saint Nicholas Church, St. Nicholas Parish Records 1811-1900, 59 Heirat. [S953] Saint Nicholas Church, St. Nicholas Parish- Familienregister, 270a. [S967] Baden Germany Roman Catholic Church of Hilpertsau, Hilpertsau Church Records 1810-1869, Deaths, 1828, S11.p. 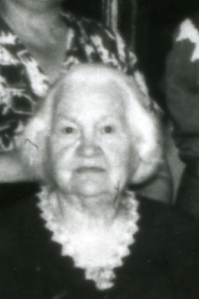 61, Death of Carolina Krieg, wife of Mathias Wunsch. Katherine married Maurice Halter after the death of Maurice's first wife. 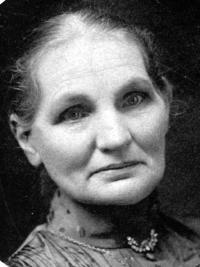 In 1899, she immigrated to America to live with her daughter Emily Halter Sobon. Katherine was an excellent housekeeper and dressmaker. She was very immaculate, altruistic, very religous, had a great sense of humor and could be very contrary. She died of a cerebral hemorrhage in 1927, while visiting the home of her nephew, Julius Halter at 3475 W. 62nd Street, in Cleveland. She is buried in Calvary Cemetery in Cleveland next to her step grandson, John Halter. [S9] Cleveland Vital Records, Cert. of Death for Katherine Halter, Reg. No 9375. [S710] Section 24, Lot 414.